It's easy to find a prospect on LinkedIn and to think that your job is half done. Learn a little bit about their interests and hobbies, pick up the phone and call them. The social salesperson's whole mentality has moved from cold calling to warm calling. In my opinion it is still a cold call and now you're not just an annoying sales person, you're also a stalker! We all know that the best way to make a sale is through a referral. This could be through a customer or a friend. Either way, a referral gives you credibility and that is what turns a cold call into a warm call. Don't get me wrong, using social media to identify sales suspects/prospects is a good place to start. The question you need to ask is "How do I get a referral?" 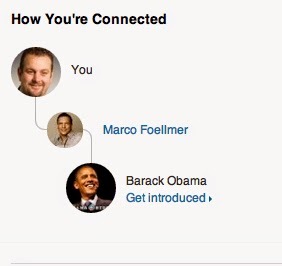 LinkedIn is a great tool for enabling us to identify people who may know your suspect. Again, the natural inclination would be to call someone you know and ask them to make a referral. However, just because they seem to be connected on social media, doesn't mean there is a trusted relationship. Let's face it, if you are having to ask for a referral, there is a problem. You have to earn a referral. Sounds a bit like real world selling, right? 'Social Selling' is about using social media tools to improve real world selling. Over the past few days, I have identified a number of suspects. There are about 200 of them in total. I have been through each profile and kept a tally of the people in my network who are connect to them. My goal has been to identify the top 10 people who are connected to my list of suspects. This list seems to contain people I know well as well as others who I am yet to meet. They are potentially people with the ability to influence a number of my known suspects. Which relationship is of more value to me, the influencer or the customer? The influencer! Having identified these people, I am going through the process of earning (not asking for) a referral. I am frantically setting up meetings with these influencers. I need to understand how I can help them. Sooner or later, if they will be interacting with my sales suspects. If they like me, then they will make an unsolicited referral.